Wednesday. The last time he scored? Villa away in 2010. Well, that's one job done. Arsenal's 2-0 win over Montpellier ensures Arsenal's passage into the group stage of the Champions League for the 13th consecutive season, which is more than you can say about Manchester City, amiright? It's also another step in the right direction, which means the positive momentum from the win against Spurs last weekend hasn't been lost. The concern now is with fixture congestion. Arsenal play Wednesday and Saturday this week, Wednesday and Saturday next week, then Tuesday, Saturday, and Tuesday after that leading into the middle of December. In addition, six of Arsenal's next eight matches, across all competitions, are away from home. On paper, those fixtures, aside from Everton away on Wednesday, are largely winnable. And Everton away falls on my birthday, so Arsenal has to win, right? It's not like any Everton supporters share my birthday... They are away to the likes of Bradford City in the League Cup, Olympiacos (who are locked in third already) in the Champions League), and Aston Villa, Everton, Reading, and Wigan in the league. They'll have Swansea and West Brom at home in that span as well, and then it's Christmas. So, it's time to build a winning streak and that needs to start with 18th place Aston Villa this weekend. to work on that CONTRACT HE SHOULD BE SIGNING. So, here's the ten bajillion dollar question: will there be squad rotation for this match? I'll quote directly from Sean's Montpellier recap post from yesterday: "Should there be no rotation at all, then we can surmise that the boss intends to play Santi Cazorla and Mikel Arteta until their legs fall off." We'll have to see what Arsene Wenger chooses. It's not like Arsenal has that many options in the midfield, given the injuries in the squad. On the other hand, Wenger has mentioned that his squad has some "tired legs," so he's at least aware of it. That's something. Speaking of those injuries, there will be no return for Theo Walcott in this match, still out with a shoulder problem, though he could be available for Everton on Wednesday. There'll be no return for Andre Santos either, but it appears Kieran Gibbs will be available for selection, which is fantastic news. 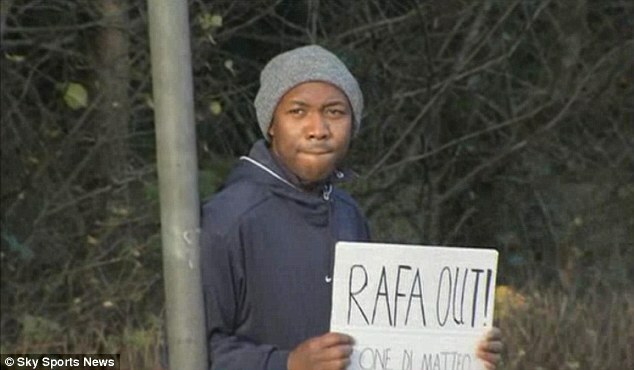 He made the bench against Montpellier. As for the long term injuries, Abou Diaby is now "3 to 4 weeks away," which is up from the "2 to 3 weeks away" that he was seven weeks ago. On the other hand, Tomas Rosicky will return to full training this week. I won't try to guess the XI; I have no idea what Wenger will choose to do with rotation. You can't rotate too much, or the squad loses the cohesion they've built over the last two weeks, but you can't rotate too little, or players will no longer be effective. duties, which are probably driving him crazy. Without much to go on in the way of news for injured players, I've had to list a number of players in the "doubtful" category, just because I'm not that sure. Close to returns from injury are noted Arsenal-killer Darren Bent, who has been out of favor, then out with an ankle injury. Defender Joe Bennett could return from a knee problem, as might midfielder Chris Herd. Less likely to return from injury are Charles N'Zogbia and Richard Dunne. Definitely out are Gary Gardner, who is recovering from an ACL tear, and club captain Stiliyan Petrov, who continues to battle acute leukemia. Ron Vlaar currently wears the captain's armband, despite this being his first season at Villa. 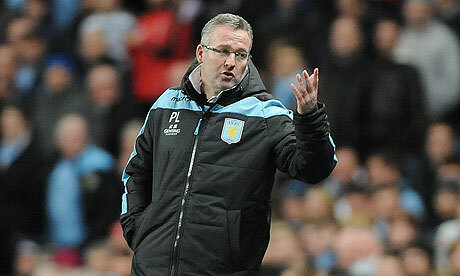 Manager Paul Lambert will serve a one match touchline ban after admitting to an FA charge for improper conduct. Here's an artsy shot of Villa losing 5-0 last week. It's funny what a win over your most bitter rival can do. Arsenal are now unbeaten in four matches across all competitions, which is the longest stretch they've gone without a loss since starting the season with seven unbeaten. In addition, since losing 2-1 at Manchester United, Arsenal have scored 12 goals over those four matches. Suddenly, it appears that the confidence is back in the side. So, everybody, be quiet. Don't scare it away! As for Aston Villa, they have won five matches out of 15, across two competitions. Three of those wins have come in the League Cup, and while one was in extra time at Manchester City, the other two were against Tranmere Rovers and Swindon Town. They have a handful of positive league results, including wins over Swansea (who were in form at the time) and Sunderland, and draws against Newcastle, West Brom, and Norwich. The wins over Tranmere and Swansea are their only home wins of the season. Villa's last two matches were against Manchester United and City; they played United well at home and lost 3-2, but capitulated 5-0 at Eastlands last week. This was the 20,000th goal in Premier League history. never again? Photo: Premier League. Arsenal faced Aston Villa three times over the course of last season and won all three. Arsenal played Aston Villa away just before Christmas last year, winning 2-1 thanks to a Yossi Benayoun header three minutes from time. Earlier in the match, Marc Albrighton equalized for Villa, scoring the 20,000th goal in Premier League history in the process. Did you remember that highly important fact? Of course not; I had to look it up myself. Surprisingly, Aston Villa had 57% possession in the match and probably deserved a better fate. Arsenal played Villa twice at the Emirates last year. The first match was a fourth round FA Cup tie, in which Villa went ahead 2-0 at halftime before Arsenal stormed back with three goals in seven minutes, including two from the penalty spot, to win 3-2. In the league match at the Emirates in March, Kieran Gibbs scored 16 minutes in, Theo Walcott added another in the 25th, and Aston Villa didn't really show up for the rest. Mikel Arteta added a third in injury time to seal a 3-0 Arsenal victory. Arsenal have only lost two of their last 27 league meetings with Aston Villa, though one of those came at the end of 2011. The last time Aston Villa beat Arsenal at Villa Park was December of 1998. Arsenal took a 2-0 lead in that match before the Villans stormed back to win 3-2. Since then, Villa have lost seven and drawn six at home against the Gunners. The referee is Lancashire-based Lee Mason. 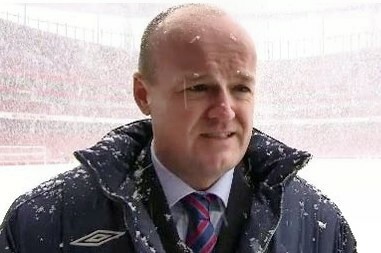 Mason took charge of one prior Arsenal match this season, the 0-0 draw at Stoke on the second weekend of the season. He's also taken charge of one Aston Villa match this year, one of their two league wins, the 2-0 result in mid-September. Last year, Mason took charge of two Arsenal matches, both wins: 3-1 over Stoke and 1-0 at Everton. He also only took charge of two Aston Villa matches last year: a 0-0 season opening draw with Fulham and a 4-2 loss to Chelsea later in the year. Lee Mason was last in the spotlight at the end of last month, when he worked the League Cup tie between Chelsea and Manchester United in the days following the Mark Clattenburg unpleasantness (which has been resolved hilariously in that John Obi Mikel is now being charged with misconduct as Clattenburg has been cleared.) I don't recall anything controversial happening in that match with Mason in the middle. Arsenal's trip to Birmingham is the late Saturday match this week; five matches will be played prior to Arsenal's on Saturday, four more will be played on Sunday. The weekend kicks off with Sunderland hosting West Bromwich Albion. West Brom continues to impress; they have 23 points, they're in fourth place, and they're five points back of table topping City. Sunderland, on the other hand, are in 15th and have only scored 10 goals this season, three of which were last weekend against ten man Fulham. Martin O'Neill, meet the hot seat. Four matches kick-off in the 10:00 a.m. Eastern / 3:00 p.m. England time slot. Manchester United hosts Queens Park Rangers at Old Trafford, Everton (still in fifth place) hosts Norwich at Goodison Park, Stoke hosts Fulham at the Britannia, and Wigan hosts Reading at the DW. Four matches will be played on Sunday, which often happens after Europa League Thursdays. The early match sees Liverpool travel to Swansea to face Brendan Rodgers's former squad. Later in the day, Newcastle travels to the South coast to face Southampton, while Tottenham hosts West Ham at the Lane. The reverse of these fixtures will be played the weekend of February 23-24.